Davidoff Royal Relase | Chicago's Pipe, Cigar & Tobacco Store | Iwan Ries & Co. It's a cigar fit for royalty—or anyone else willing to spend the money. The vaunted Davidoff Royal Release is now heading to retailers and it costs up to $100 per smoke. The high price, Davidoff says, is due to its aged tobacco and proprietary wrapper. According to the company, this limited edition is composed of a Dominican proprietary wrapper dubbed Aromatica Dominicana, an Ecuador Habano binder and a five-varietal filler blend of eight-year-old Dominican tobacco. And these smokes won't come cheap. The Royal Release Robusto, measuring 5 1/2 inches by 55 ring gauge, will retail for $80 per cigar. The 8 1/4 by 57 Salomones will retail for $100 each. 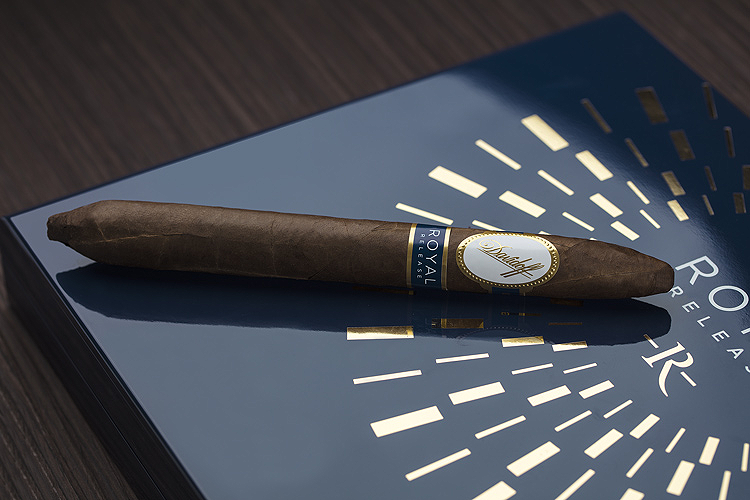 Said to be crafted by eight of Davidoff's most experienced Master Rollers, both sizes are made in the Dominican Republic at the Cigars Davidoff factory and come in royal blue, lacquered boxes of 10. Only 500 boxes of each size will be produced.